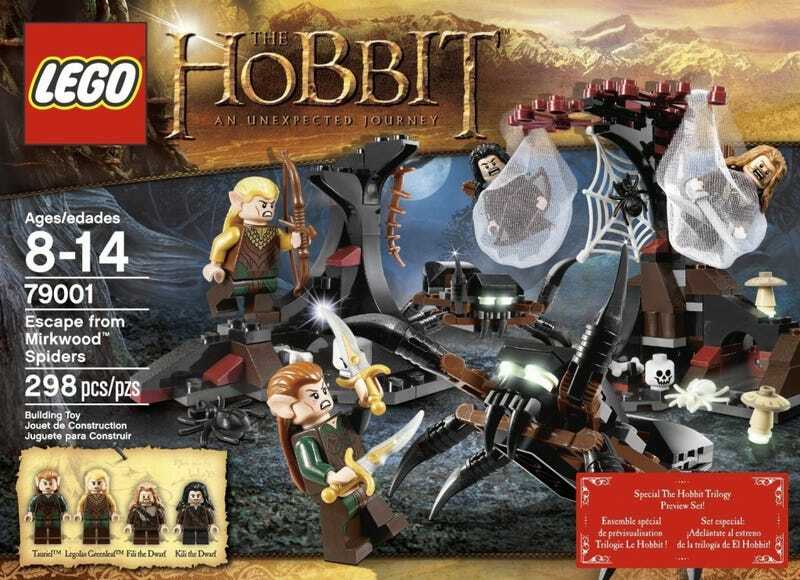 Three currently unannounced Lego sets for the upcoming Desolation of Smaug line have made their way on to eBay Germany - giving us a tiny look at what's to come in the upcoming middle movie of Peter Jackson's Hobbit trilogy, albeit in brick form. Although we already knew one Desolation of Smaug set, The Laketown Chase unveiled at SDCC earlier this year, these three new sets are yet to be unveiled by Lego officially. Let's take a look at what's inside! First up, the smallest of the three sets, Dol Guldur Ambush. This set features two orcs and our first look at the minifigure for Beorn, duking it out in the ruined lair of the Necromancer. There's not too much to it, but what is interesting is that according to the back of the box, it's designed as an add-on to the larger Dol Guldur Battle set (more on that later), implying that Beorn will play a part in dealing with the Necromancer alongside Radagast and Gandalf. Next up is the mid-scale Mirkwood Elf Army. This one doesn't really tell us much - we've already seen some Mirkwood Elves battling orcs in previous footage - apart from the fact that we might also get to see Thranduil himself heading into the fray with his fellow elves. The back of the box reveals a play feature to recreate Tauriel's slightly-cheesy CGI leap from the first Desolation of Smaug Trailer (I actually thought the unhooded Elven minifigure was Tauriel at first, but it's just an unnamed male Elf. You can never tell with these elves! ), as well as the fact that as some point Thranduil might get a little too close for comfort with a Warg. Shame he doesn't have an awesome Deer to run around on. Finally, the biggest set of the line, and perhaps the most interesting, Battle of Dol Guldur. As mentioned earlier, this set can be connected to the smaller Dol Guldur ambush, hinting that Beorn will play a part in driving out the Necromancer - but there's no sign of any other members of the White Council in the set, which is odd. Two interesting inclusions are though - firstly the Necromancer himself (who frankly, looks a little less intimidating as a Lego figure than you'd think, but I guess that's the point) and Azog, who shows up with some orcs to terrorise the two Wizards. Both Gandalf and Radagast are shown casting some rather un-Tolkein esque magic spells on the box, but whether that's fanciful attention grabbing packaging or an actual element in the films remains to be seen. These Hobbits sets are due out later this year and in early 2014, in time for The Desolation of Smaug's release in December. UPDATE: The LEGO Group has requested that io9 remove the images previously included in this post, and I have complied with them. You can still see the images via the link below.